I have a Purchase order for material A. During Inbound delivery creation, I add an item to the delivery for material B. Item category has been configured to post a 501 posting for this new item. In SAP EWM, I am able to post goods receipt for both materials without issues. However, the delivery gets stuck in the ECC Inbound queue with error message "There is no purchase order assigned to the delivery item." Of course this message makes sense, though I want to be able to perform a GR posting without reference to a PO. For some reason this does not seem possible. Any feedback on how to handle this scenario? - post a GR with MIGO and the movement type 501, so that the system creates an inbound delivery in the background. You will get a separate inbound delivery this way, in ERP and in EWM, so not sure if you want that. I never tested the scenario in the way you did, don't know if there is any way to get this running otherwise. 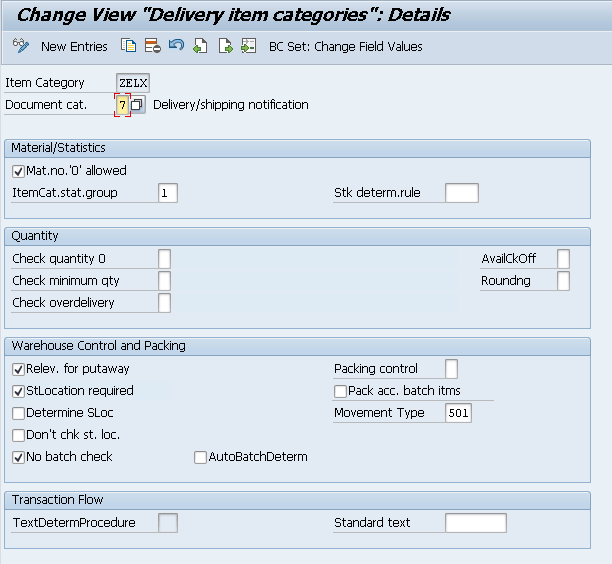 I actually just copied the standard item category (it is item category in ERP, not item type) ELN (the sales item category, as this is required) to a new item category ZELX (because ZELN was already used) and changed the movement type in the new delivery item category 501. And of course set up the item category determination for my delivery type without the usage V for this new item category. Oliver - I did a GR in ECC using transaction - MIGO with 501 movement. System automatically creates delivery document (review in VL32N) on default plant vendor. Then process the delivery in EWM as per normal put away process. They key is to ensure the ECC delivery is created on default Plant Vendor. In your case, if you add a line item in existing PO based inbound delivery in ECC, the vendor would be external vendor. This would cause an issue when GR is posted back in ECC from EWM. "In your case, if you add a line item in existing PO based inbound delivery in ECC, the vendor would be external vendor. This would cause an issue when GR is posted back in ECC from EWM." Why? It worked in my case.